Tame your eyebrows! Try taking clear mascara (also known as brow gel) and sweep acorss your eyebrows. This helps to tame wild unruly hairs without having to pluck them (ouch)! If you tend to fill your brows in with powder or pencil make sure you allow the gel to completely dry before filling! 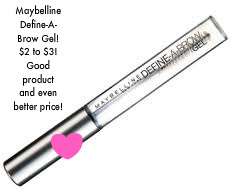 Check out the Favorite Product album to see which eyebrow gel I use! « Primer for the Lids!